I am jealous of some of these baby rooms! I would totally have some of these designs in my own bedroom. 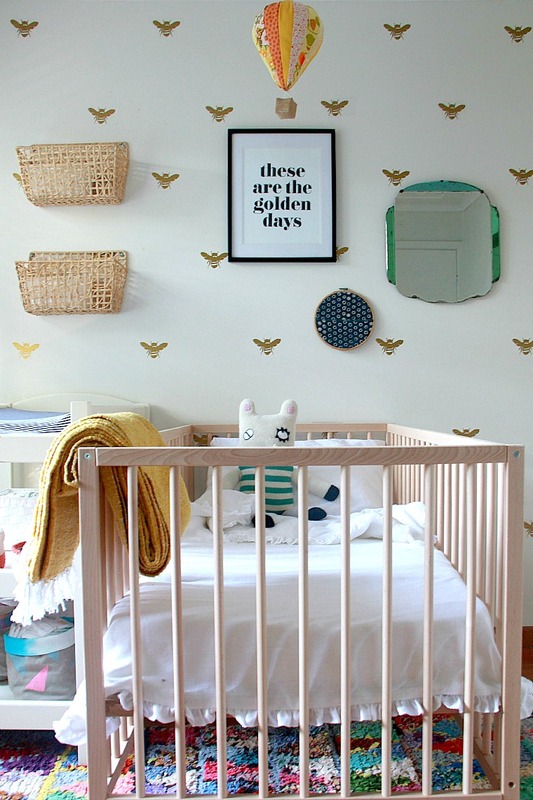 Check out these adorable nursery ideas. We have gathered 5 cute ones! They are the perfect inspiration for your little one to play, explore and rest their head. Bee wallpaper, hot air balloon mobile, baby bed looks so comfortable and cute. These are the golden days for sure. See more of the room tour here. Triangle wall decals and cute bunny heads? Rest of the nursery here. Oh I am a sucker for some bunting! Bruno has a great room! Pink walls with ice cream cones and rain drops?? You gotta see the rest of the nursery. Chalkboard walls in the nursery are def something that will grow with the little one. Such a great idea Little Green Notebook. Be sure to check out our other nursery ideas in our Kid Living section or of course our Punky Kids Rooms board on Pinterest.